By Dan Ambrose: Jermall Charlo says he’s waiting for his opportunity to face WBC middleweight champion Gennady ‘GGG’ Golovkin, and he thinks he can become the first guy to defeat him when the time comes. It might come soon for the 28-year-old Charlo (27-0, 21 KOs) for him to back-up his tough words considering that the World Boxing Council president Mauricio Sulaiman is saying that his organization will be ordering GGG to face Charlo if the Saul Canelo Alvarez vs. Golovkin fight doesn’t get made for September 15. As of now, Golovkin’s promoter Tom Loeffler is attempting to thresh out a deal with Canelo’s promoter Eric Gomez of Golden Boy Promotions for September, but it’s still a work in progress. Golovkin made it tougher on himself by changing his mind about the 65-35 purse split that he’d agreed to for the May 5 rematch, which was canceled. Golden Boy expected Golovkin and Loeffler to stay with the same 65-35 numbers for the September 15 fight. But Golovkin changed his mind, saying that he wants a 50-50 split for the Canelo fight now after he tested positive for clenbuterol last February and then left him hanging in pulling out of the May 5 fight on three weeks’ notice. Charlo, 28, looked very good in defeating Hugo Centeno Jr. (26-2, 14 KOs) by a 2nd round knockout last April to win the interim World Boxing Council 160 lb. title at the Barclays Center in Brooklyn, New York. The Charlo-Centeno Jr. fight was televised on Showtime, and a lot of fans got a chance to see the bigger and more powerful of the two Charlo brothers. Charlo didn’t need to take the fight with Centeno Jr., because he was already the WBC mandatory to Golovkin after beating Jorge Sebastian Heiland last year in July in stopping the Argentinian fighter in the 4th round. The move by the WBC to have Charlo fight Centeno Jr. for the interim WBC middleweight title means that here’s a possibility that he could be made champion without fighting if Golovkin chooses not to fight him. “My strategy is to take out one of the big names so I can reign in the division and eventually take over the whole division,” Jermall Charlo said. Charlo has the youth to take over the middleweight division at some point. What Charlo needs is a big win over Golovkin, and from there look to take out Saul Canelo Alvarez, Sergey Derevyanchenko, Daniel Jacobs and then Demetrius Andrade. Charlo might end up scaring off most of those guys if he beats Golovkin. Canelo’s promoters at Golden Boy never matched him against Charlo when the two were at 154. Charlo held the IBF 154lb title, and it would have been easy for Canelo to fight him. That didn’t happen. Canelo went after Liam Smith in September 2016 when he moved back down to junior middleweight after vacating his WBC middleweight title in what appeared to be a move to avoid Golovkin. Fighting GGG will be Charlo’s chance to show that he’s the real deal at middleweight. If Charlo loses to Golovkin, then he’s going to have to go in another direction towards fighting the likes of Jacobs, Andrade, Derevyanchenko or Canelo. It’s going to be tough on him. Charlo believes that Golovkin is in the right by asking for a 50-50 percentage split for a fight against Canelo Alvarez. Charlo says Golovkin is in the right to be looking to take advantage of Canelo pulling out of their May 5th fight after testing positive twice for the banned performance enhancing substance clenbuterol. “If it was me in that situation, if I was in the Golden Boy staff, I would consider it [agreeing to the 50-50 purse split GGG is asking for] because the things Canelo did not to make the fight not happen, failing the drug test and the things that he did not to keep his end of the bargain,” Charlo said.”Of course, in his next go round, I’m not going to give him even,” Charlo said about Golovkin. “I’m going to want more too. It has to be fair on both sides because Canelo should have kept his end of the bargain, and he didn’t. It’s really GGG’s turn to exploit what Canelo didn’t do,” Charlo said. Golovkin’s promoter Tom Loeffler has Golden Boy in the right position to get a better deal for the rematch against Canelo in September, but it would be very surprising if he’s able to get anywhere close to the 50-50 deal that GGG wants. The only way that has any chance of happening is if Golovkin is deadly serious about only wanting to fight for a 50-50 equal purse split. If Golovkin just said that he wants a 50-50 deal in order to get a slightly better purse split than the 65-35 split that’s being offered to him by Golden Boy, then he’ll probably agree to a small increase in the percentage split to 60-40. That’s likely the number Golden Boy will counter with in the negotiations. If Golovkin is willing to agree to that, then the fight will probably get made. If Golovkin sticks it out for the full 50-50, I doubt that Golden Boy will agree to it unless they’re worried about Canelo’s future longevity in the middleweight division. In looking at Canelo’s last performance against Golovkin, Golden Boy should be very concerned about his ability to beat the best in the 160lb division. Golovkin didn’t even press Canelo full bore the way that Jermall Charlo, Jacobs and Derevyanchenko would do, and he still appeared to beat by four rounds. It’s more likely that if the Canelo-Golovkin II rematch doesn’t get made in September, the fight will take place in December if GGG agrees to a lower percentage deal that Golden Boy wants. We’re probably looking at 65-35 once again or maybe 60-40, but no better than that. Jermall’s brother Jermell Charlo, who holds the WBC junior middleweight title, is also interested in fighting Golovkin. Jermell is slightly smaller than his brother Jermall Charlo doesn’t possess his punching power or his aggressive style of fighting. Jermell is a more of a boxer, who can punch when he sits down on his shots. Jermell would likely struggle badly against Golovkin, as he seems to stress out when he’s pressured by his opponents. Gabriel Rosado gave Jermell all kinds of problems in 2014, and Vanes Martirosyan did the same against him in 2015. Martirosyan fought well enough to deserve the decision, but he judges gave it to Jermell by a controversial 10 round unanimous decision. “I don’t think that whenever the WBC reaches out about a fight that they’re doing it just to play around,” Jermell Charlo said to skysports.com. “We would love to be a part of a GGG fight. 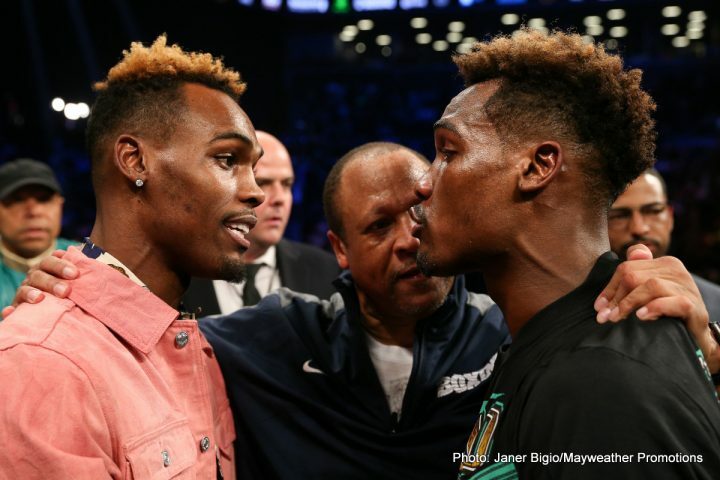 We’re tired of hearing the media say to put the Charlo’s in there with better competition,” Jermell Charlo said. It’s extremely doubtful that Jermell will get a fight against GGG before his brother Jermall. That would be a crazy move on Team Golovkin’s place to setup a fight against Jermell rather than Jermall, as it would make him Triple G look like he’s ducking his WBC mandatory. Golovkin isn’t going to do that. He’s obviously trying to setup a rematch with Canelo to prove to the boxing world that he’s the better fighter, but also to secure his financial future. There’s a lot of money for Golovkin to make fighting Canelo. Golovkin can’t make the same kind of money fighting the Charlo brothers. That’s like Golovkin fighting Martirosyan again, and the money is nowhere near the same. Golovkin-Charlo is not a PPV fight.